Our friends at GloryBee sent over a jar of habañero-infused honey. While ideas for using this honey are vast, with the summery weather, this cool yet spicy Habañero Strawberry Chia Fresca really hit the spot. Hot tip: add a shot of tequila for a snazzy cocktail hour. Make your Habañero Strawberry Chia Fresca! 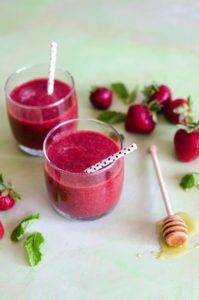 Puree strawberries, honey, and mint in a blender until smooth. Stir in chia seeds. Portion puree between two serving glasses. Drink as-is or top with club soda and ice.